Name of booth: Tatsuya Co., Ltd. This is a Kobe-beef specialty store established in Kobe with 110 years of history. In year 2015, we began to provide Halal Kobe beef. 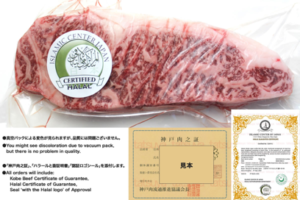 In year 2015, we began to provide Halal Kobe beef. Through the Islamic Centre Japan’s halal certification, the beef is processed in the slaughter house with ESMA halal certification from the UAE government. Besides exporting it to UAE, we also handle orders from customers from Singapore who buy them back as souvenirs. Feature: The only Kobe beef in the world that has halal certification. Don’t you want to show the hospitality of Muslims with Kobe beef, which is recognised worldwide for its taste and quality? We also handle exports to UAE and souvenirs for Singapore customers (up to 5kg).